At 3’s Company, you'll have a welcoming and relaxing experience knowing our friendly, professional stylists will provide you with quality service every time you visit. You’ll always leave 3’s Company with the look you want at an affordable price. 3’s Company provide a full range of hair services including women's ​haircuts, men's haircuts, kids' haircuts, color services, perms, styling, and lip and eyebrow waxing. Whether is just your everyday style, a special event, or a formal affair, our stylist cater to your every needs. Looking for a new hair salon? Let our team of professional hairstylist design a new hairstyle for you! 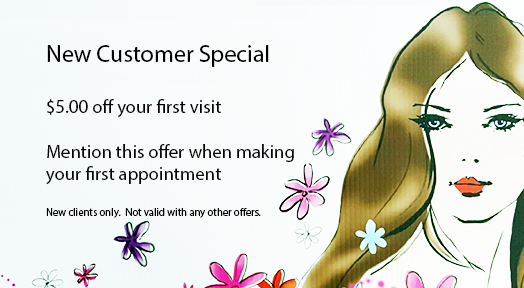 Take advantage of our new customer special offer! "I've been getting my hair cut and colored at 3's Company for over ten years. I always leave with a satisfied smile. I like the relaxed and friendly atmosphere which is very important to me. I have referred other people to check out 3's Company and have been told that they were very satisfied. Keep up the good work. ​"Rita, spends the time to make sure my hair looks great each and every time I am in for a visit. You can tell the team at 3's Company are friendly and accommodating to each and every customer that comes into the salon. ​I also like the convenience of getting my hair products there when I am in for my hair cut. Bill A.